How does Chennai rank in walkability compared with other Indian cities? With pedestrian footpaths either non-existent or unusable, Chennai’s roads are among the least conducive walking spaces in the country, said Pawan Kumar, Associate Town and Country Planner, Ministry of Urban Development. Find out why. 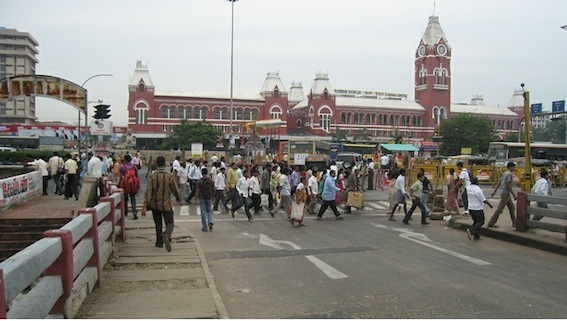 Chennai is the fifth most populous Indian city with an aggregate population of almost 8 million. As a city grows both in economic and area terms, transportation becomes a major challenge, and the same is seen Chennai in the last decade. Traditional modes of traveling like walking and cycling over the years have got less priority over motorized modes in a rapidly growing economy, which have had its pitfalls like congestion, pollution, accidents etc., which make daily commute or walk a highly stressful and risky one. Therefore there is a strong need now to make the city pedestrian friendly by providing them safe walkways and exclusive cycle lanes. To measure and benchmark the various conditions of walking, both tangible and psychological, a walkability index consisting of nine parameters were arrived at, slightly modifying the Global Walkability Index. The survey interviewed 300 pedestrians over 30 km at various land use types such as residential, commercial, educational and public transport terminals to analyze travel behavior, preferences, areas for improvement etc. Chennai scored low on the walkability index with an average of 40 (out of 100) among the different land use types, with public transport terminals scoring the least with 35 and commercial areas with 42 the highest. What this means: The approach to transport terminals like railway stations, bus stops by foot is difficult due to lack of safe, level, and clear footpaths and crossings. Among the nine parameters used to gauge walkability, infrastructure for people with special needs scored the lowest with 25 and security from crime scored highest at 55. What this means: People on wheelchairs and other disabilities have little or no mobility on the city roads as pedestrians, with uneven, discontinuous pavements, absence of ramps and handrails, forcing them to use their private vehicles, or making their daily commute a struggle. For people who cannot afford a vehicle, the city is unforgiving, thereby denying equal opportunities to all. The reason for people to feel relatively safe on the streets is probably due to the presence of vendors or hawkers on the streets, which make them inhabited and hence psychologically safe. Efficient street lighting also plays a part in this score. 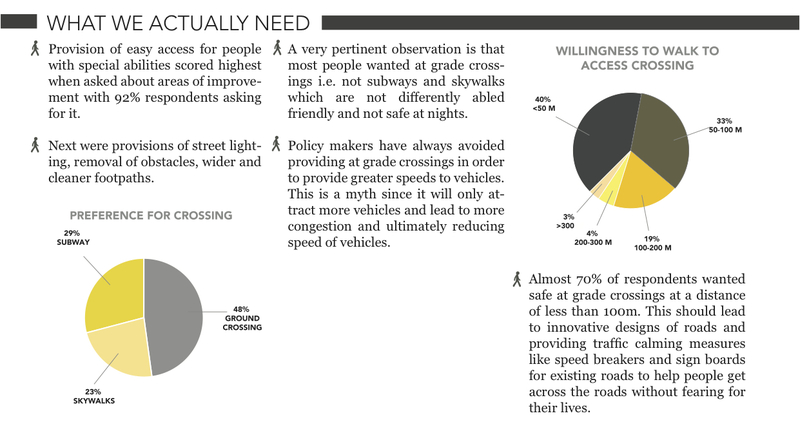 In the rating of existing pedestrian facilities, 70% felt that it was bad to okay. What this means: Since a large percentage of pedestrians had a bad opinion about the infrastructure accessible to them, it can definitely be inferred that they would like to see better facilities, which not necessarily be capital intensive. Exposure to air pollution is another deterrent to walking with 35% responding that they are most exposed to air pollution when they are walking. Two Wheelers, bus and train users are next with 23% and 14% respectively. 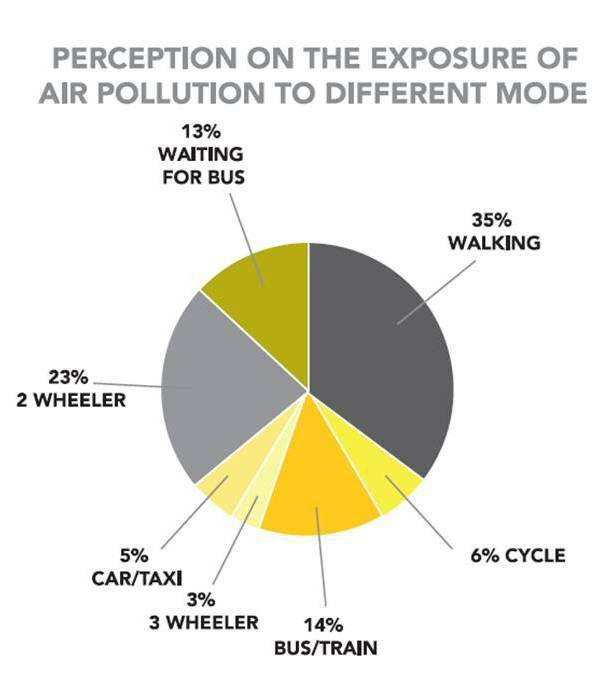 13% feel they are exposed to air pollution while waiting for the bus. What this means: It is ironical that people who use NMT and public transport are continuously exposed to high levels of air pollution, while contributing the least. This has severe bias towards the economically weaker sections of society, as they simply cannot afford to escape this condition. Provision of easy access for people with special abilities scored highest when asked about areas of improvement with 92% respondents asking for it. Next were provisions of street lighting, removal of obstacles, wider and cleaner footpaths. 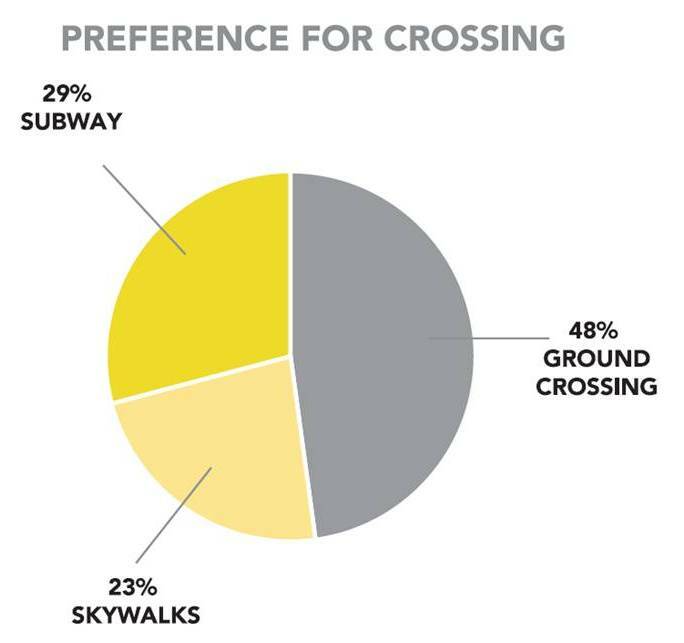 A very pertinent observation is that most people wanted at grade crossings i.e. not subways and skywalks which are not differently abled friendly and not safe at nights. Policy makers have always avoided providing at grade crossings in order to provide greater speeds to vehicles. This is a myth since it will only attract more vehicles and lead to more congestion and ultimately reducing speed of vehicles. 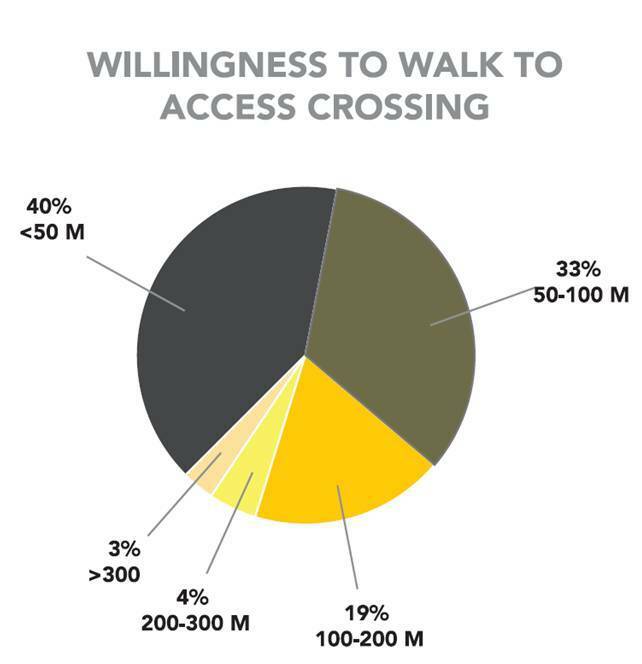 Almost 70% of respondents wanted safe at grade crossings at a distance of less than 100m. This should lead to innovative designs of roads and providing traffic calming measures like speed breakers and sign boards for existing roads to help people get across the roads without fearing for their lives. 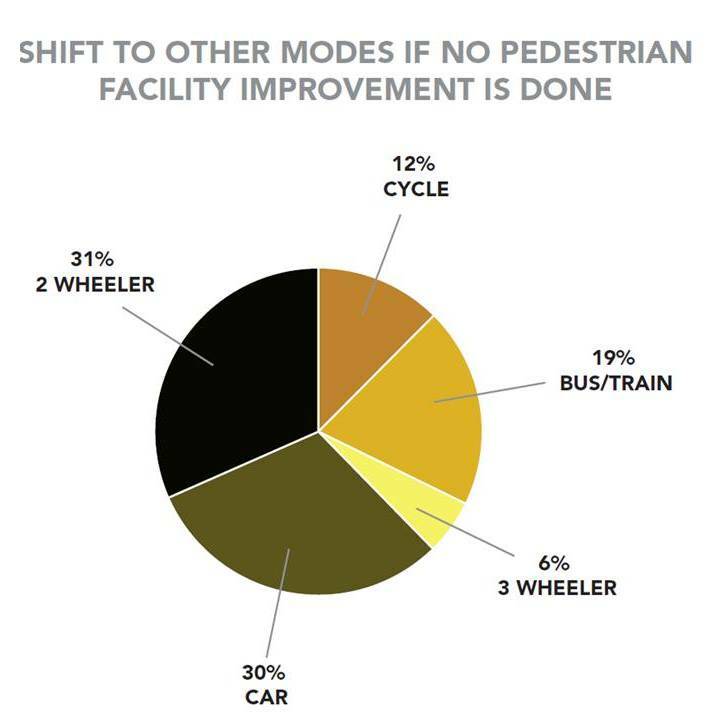 Over 60% of respondents wanted to shift to cars and two wheelers if facilities for walking were not improved. Due to increased focus on motorisation, and deterioration of pedestrian facilities there has been a continuous exodus from NMT to motorised modes, which has led to the current levels of high motorisation, forcing people (even those who are unwilling) into investing their hard earned money on a depreciating asset. Even the 19%, who want to shift to bus or train, would still have to walk a certain distance to reach the stops/stations, continuing them to the perils of being pedestrians.